My beautiful, sweet little boy turned four yesterday….four!!! I can barely believe this. This little person, who four years ago was just this tiny little baby in our arms has grown into a sweet, spirited, amazing little boy who delights in everything he sees and does. We are so blessed to have him as our son; everyday he says or does something that completely fills us with joy. It’s supposed to be a monkey. A cake decorator I’m not, but it tasted really good. No cake from a box here folks. We’re talking from scratch with buttercream frosting. Little Man was quite thrilled despite the goofy monkey. I wish I had thought to put together a tutorial on this, especially for the sword. We decided to make a soft sword as he is not quite ready for a wooden one. The Skeptic took some hard foam and cut it, glued it, and reinforced the handle with a bit of wood. I sewed four pieces of fabric to slide over the blade and handle. We sewed it all together in the middle of the handle with a patch, then tied twine over the patched area. It turned out great and no one can get hurt if he gets a bit too wild with it! The tunic just goes over his head and ties around the back. I copied the applique from a cape that he has. The whole birthday was wonderful, with friends and family helping us celebrate. Happy birthday, my dear little boy!! It was an absolutely perfect weekend. This makes three birthdays down, one to go! You’ve still got one week to get your contest entry in! Happy Birthday Little Man! Love the gifts. I may have to bug you for that tutorial in a couple of years. Love your Easter eggs too! Congratulation on birthday’s, holiday’s, and altogether family bonding! I know that is something that is rare and precious these days! Happy Birthday! So far, 4 has been pretty good here. The soft sword is a great idea. We have a wooden one hiding in the basement because I just don’t think it would be a good idea yet. 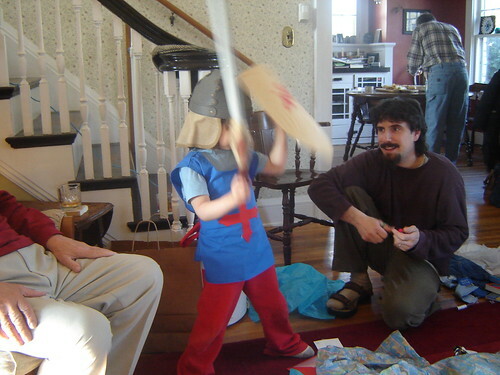 With two boys and a Renaissance Fair addiction, I have to tell you, we have enough swords and shields at our house to form a small child-army. Boys. (Oh, and how about the brio-type trains?) Happy birthday to Little Man. Looks like you had a great easter weekend! That cake looks scruptious! Your son’s knight’s gift is fantastic too! What a wonderful weekend!!! And I think you did a great job on the cake. I never really mastered buttercream…but I do love it!! Happy Birthday, Little Man. You are your Knittymama’s knight in shining armor! Happy birthday Little Man, I love the cake. What a great job you did on his costume. I love the earrings. Happy birthday to the Little Man! Four is a fun age so far for us, I hope it is for you all too. He got some super cool knight gear, I’m really impressed with the work you and the Skeptic did! Great work! The cake is so cute…what a great job. Wow 4 is a fun age. You guys were so creative with the knight gift. I agree that 4 is a fun age. Enjoy! !